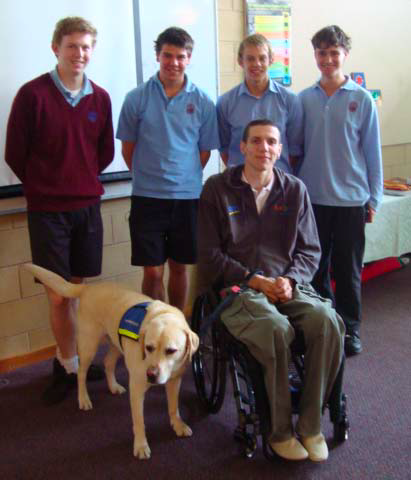 On the first day of term 4, the Year 11 students heard from Anthony Gray who at 19, was a victim of a BMX accident that resulted in a spinal cord injury, leaving him in a wheelchair for the rest of his life. Anthony is now a speaker for the RACV SpinChat program which aims to raise awareness, promote prevention and to educate secondary students about spinal cord injury. After showing us a short video that included interviews with him and other victims of a spinal cord injury, Anthony shared with us his story. He told us about his normal life before the accident, the fateful day in detail, the long recovery period and his life now. Like most people Anthony believed that this sort of injury wouldn’t happen to him. Even right after the accident he tried to get up not realizing how badly he hurt himself, and once in hospital he said he thought that he would get better and life would go back to normal. Unfortunately there is no cure for spinal cord injuries but that doesn’t mean Anthony doesn’t still enjoy life. He plays wheelchair rugby and is an active member of his local CFA. I thought it was great to hear such a personal story from someone who has really been through it. Anthony’s story shows that a spinal cord injury can happen to anyone but common sense precautions can prevent most of them.